I'm not a huge fan of dashboards that take up valuable space on the monitor and I dislike the Windows Vista Sidebar mainly because of its inflexibility and resource consumption. 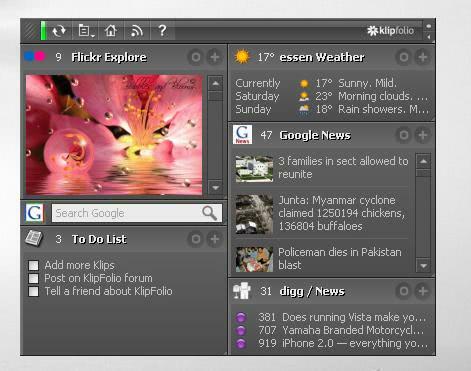 Klipfolio on the other hand is a customizable dashboard for Windows that uses less system resources and provides better options than the Windows Vista sidebar. The first thing that I noticed was that it is highly flexible. It is possible to increase and decrease the size of the whole dashboard or of single Klips, to dock it to edges of the screen and even create separate dashboards and place them in different locations on the screen. This means you could dock one part of the dashboard that is displaying information about the computer, memory, cpu and hard drive usage, in a bar at the top of the screen and another part of the dashboard in the right sidebar that is displaying RSS Feeds, Gmail Messages and other information. The sidebars can be set to automatically hide the contents, stay always on top or behave normal. Winamp users will recognize the way Klipfolio handles and connects the single elements of the dashboard because it looks and feels like an advanced version of the way Winamp handles the separate program windows for years. The image above is showing the compact dashboard that is not docked to any part of the screen. Each Klip can be customized in numerous ways. The layout can be changed which I briefly mentioned already. Far more interesting is the Alert option. This option can display a popup message and / or play a sound when new items are added, items change or specific words appear in the item. More than 4000 Klips are available on the Klipfolio homepage. Each Klip can be downloaded and installed individually. One excellent feature are the so called Klip Sets which are themed Klip collections. You can find sets for gaming, poker and tools for instance. 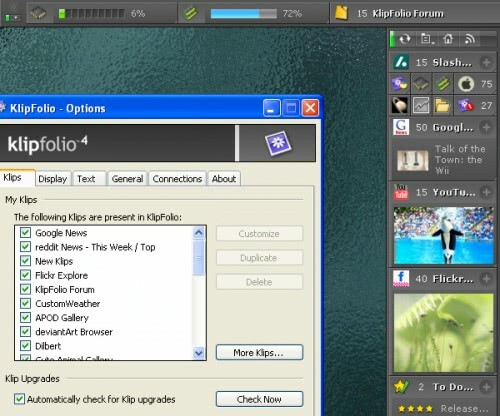 Klipfolio is exactly what I wished the Windows Vista sidebar would have been. That pretty much sums it up. It uses less ressources, offers way more ways to customize the layout and provides the user with more ways to customize each individual item. I agree with you mate that where the case of dashboard comes in windows vista it fails. I think some work needs to be done on it. I tried it in 2007 – but that time I don’t find it to useful for my needs. So now I live with RSS, E-mail and classic page change monitor Webmon.